I agree, you have a beautiful garden, and welcome from me too. I agree too what a lovely garden. Welcome. Gorgeous garden Heron.. and a big Hello fro me..
What a lovely garden you have Heron. Hello there what a smashing garden and what a view. what type of dog shares your garden ? Welcome to GoY Heron, wonderful garden you have so peaceful looking also a beautiful view too. Hi Heron - Welcome from me too. It must be cool to live next to an inland ocean. How big is your lake? It looks 20 feet+ to me. Can't see any lilies - what is your favourite water plant? Welcome from me as well ... fantastic view of your garden! Phew! Strewth! blimey! absolutely gorgeous, hes only been here 5 mins and he's raised the standard so high I'm either gonna have to tidy mine up or move to another site like dumps r us !!! Terratoonie, In answer to your question I share my garden with Barnaby, a Lhaso Apso. I'd be happy to show his pic but not sure where to post it. Post it on here Heron. There's as many animals as there are gardens! Let's keep him guessing ! Laughing quietly at you two girls giggling! love it!!!! Terratoonie I've posted a pic of Barnaby but I've no idea where it is, still not found my way around yet. Heron, scroll to the top of this page and click on 'Garden Pictures'. If you look through them you'll see the newest first, look back a page or two and you'll see the picture you posted. If you'd like to know more about a member, click on their name under their avatar and it'll show you their profile etc. Thanks Louise, I'll do it now. I have already found my pics and re-named the knicker pink rose. Learning for me is in slow motion these days. I think he's ran off ! Oh, what an idiot i am. Of course, as people add pictures the page he was on gets moved backwards, currently he's on page 6 !!!!! When you go onto the garden pictures page scroll down to 'Latest garden Pictures' and see 'recent Garden Photography'. Is this Heron Swooping then? This area looks SO much like my own backyard..
We have a large farm field to the south, undeveloped acreage to the east, a similar tree line across the field, and similar sq.footage area. I have bookmarked this one for future reference of what I want to do "someday" with the backyard. Absolutely beautiful! WOW, Heron. One of my favourite homepages. More photos please, MORE, MORE, MORE !!!!!!! 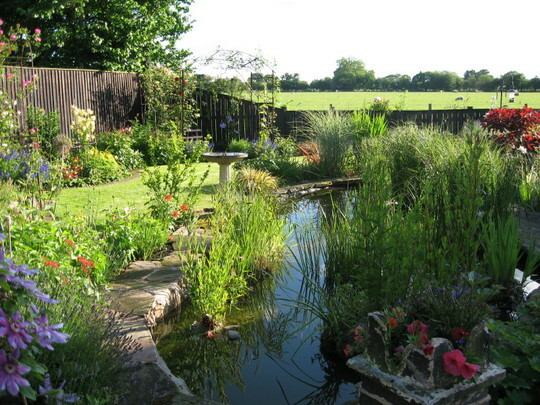 Love your garden and pond area, you're love of gardening is quite evident ! what a gorgeous garden and lovely views beyond it, you are very lucky, i think i would sit by that pond everyday ~ even in the rain! and its as pretty in the flesh so to speak !